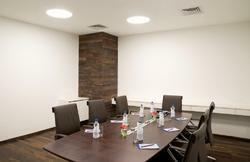 Being a well-established organization, we bring forward an excellent quality range of Meeting Room Table And Chair. - Area : 8 ft. x 8 ft.
We are offering Meeting Room Table which is manufactured byhigh quality raw material and advanced technology. Clients can avail the offered product from us at the most reasonable price range.